The Canon EOS 5D Mark II is one of the best full frame DSLR released in 2008. 5D Mark II was replaced by 5D Mark III in 2012, but there are still a lot of 5D Mark II users in the world today. Today, we are showing you top rated Canon EOS 5D Mark II lenses, tested by DxOMark. 50mm portrait lenses are most used lenses for 5D Mark II. There are a lot of great prime lenses. The best one is of course the Zeiss Otus 1.4/55, but the price is too expensive. The new announced Sigma 50mm f/1.4 DG HSM art lens is one of the best 50mm lens you should consider. If you need a cheap lens, the best choice is EF 40mm f/2.8 STM and Sigma 50mm f/1.4 EX DG lens. Beside the 50mm lenses, the 85mm, 100mm, 105mm, 135mm lenses are also popular. This time, the new released Zeiss Otus 85mm f/1.4 lens and Zeiss 135mm f/2 Apo Sonnar T* has the highest DxOMark score. The Sigma 85mm F1.4 EX DG HSM lens took the second position. The cheap EF 100mm f/2 USM lens is also a good lens. If you are find some really cheap lenses for 5D Mark II, you may take a look at Samyang 85mm f/1.4 Aspherical IF. The 24-70mm Standard Zoom lenses are must own lenses. It is clear that the EF 24-70mm f/2.8L II USM is the best choice for image quality. For a lower price, you may also consider the Tamron SP 24-70mm, which is just one point below the EF 24-70mm f/2.8L II USM. And the new released Sigma 24-105mm f/4L DG OS HSM Art lens is another great lens. If you are considering some telephoto zoom lenses for 5D Mark II, people usually try the 70-200mm lenses. This focal range covers a lot of requirements and is used regularly by photographers in most genres. The new Tamron 70-200mm f/2.8 lens tests well, this lens is even one point better than EF 70-200mm f/2.8L IS II USM. If you want a lens around $1,000, you may also try EF 70-200mm f/4L, and Sigma 70-200mm lens. The 70-300mm lenses are often seen as “kit lenses”. They are effectively cheap lenses that offer a decent focal length, but generally the compromises made in achieving the large focal range mean image quality suffers. 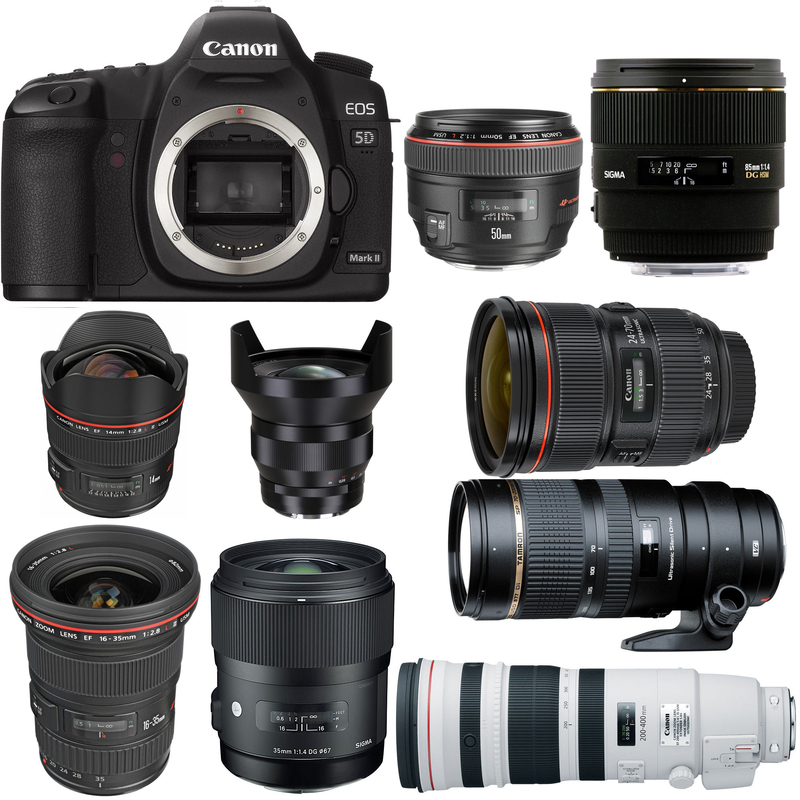 Of the four lenses, EF 70-300mm f/4-5.6L IS USM is the best choice for 5D Mark II. If you are looking for some super telephoto lenses, below are best lenses for you to choose. The best lens in this range is the new Sigma 120-300mm f/2.8 DG OS HSM lens, and the new announced EF 200-400mm f/4L IS USM Extender 1.4x is also a great lens, but the price is too expensive. There are two new super telephoto zoom lenses yet not tested, but should be great lenses: EF 100-400mm f/4.5-5.6L IS II USM lens and Sigma 150-600mm f/5-6.3 DG OS HSM Sports lens. If you are looking for some super telephoto prime lenses, below are best lenses for you to choose. The EF 300mm f/2.8L is one of the best super telephoto prime lenses, even 2 points better than the 400mm f/2.8L. The cheap Samyang 14mm f/2.8 lens has the highest DxOMark score, even better than the Zeiss 15mm f/2.8. Within the wide-angle prime lenses, the Sigma 35mm F1.4 DG HSM A lens is the best. Second best lens is EF 35mm f/2.0 IS USM lens. The third lens is the Carl Zeiss 35mm f/1.4 but as with the previous Carl Zeiss lens, this is a manual model with no AF. The EF 24mm f/1.4L II USM is another good wide-angle prime lens except the price. If you are planing to buy a wide-angle zoom lens for 5D Mark II, the EF 16-35mm f/4L IS USM is one of the sharpness lenses from the list. The Tokina AT-X 16-28mm f/2.8 Pro FX lens is also good ones for 5D Mark II with a low price than EF 16-35mm f/4L. For Macro lenses, the best macro lens tested on Canon 5D Mark II is Zeiss Makro-Planar T* 100mm f/2, this is a great lens but very expensive. So one of the best choice is EF 100mm f/2.8L Macro IS USM lens at the price for $1,049. If you need cheap one, the Sigma 70mm f/2.8 and Tamron SP 90mm f/2.8 are both good macro lenses.